Heat oil in 12-inch skillet over medium heat. Cook onions, rosemary, parsley, thyme, garlic and chili in oil 5 minutes, stirring frequently. Add chicken to skillet. Cook about 15 minutes, turning occasionally, until chicken is brown. Add mushrooms, 1/2 cup of the wine and the vinegar. Heat to boiling; reduce heat. Simmer uncovered about 5 minutes or until about half of the liquid has evaporated. Pour remaining 1/2 cup wine over chicken; sprinkle with currants and salt. Cover and simmer about 20 minutes or until juice of chicken is no longer pink when centers of thickest pieces are cut. Uncover and cook 5 minutes longer to crisp chicken. 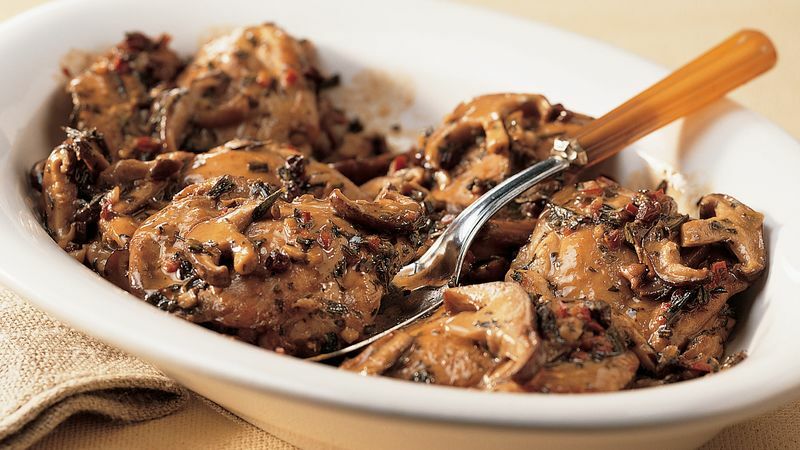 This interesting recipe is also known as pollo ubriaco ("drunken chicken"); sometimes two full cups of wine (one white and one red) are added. In this case, the vinegar offers the contrast of flavor in place of red wine, and the currants bring an interesting sweet effect to the peppery undertone. Dip slices of toasted rustic bread in the juices for a delicious treat.